Dr. Young is a Far Western Principal and serves as Director of cultural resources consulting and research at Far Western’s Great Basin Branch in Carson City, Nevada. Living and working in Nevada for over 30 years,Craig has been instrumental in assisting private industry and government agencies successfully navigate the regulatory process for projects across renewable energy, transportation, communications, and natural resources sectors. His direct engagement in active research, open collaboration, and public outreach provides a foundation for creative project management and continues to build trust with resource managers and review agencies across the region. In addition to guiding and collaborating with the skilled Far Western team, Craig is an active scientist working daily in western North America. 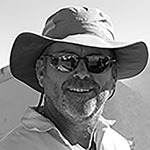 His research interests include environmental influences and geomorphological processes affecting archaeological site formation and, ultimately, people’s interaction with a changing landscape, and he has been awarded funding for geoarchaeological studies from the National Science Foundation, the Department of Defense, the Department of the Interior, and the Lincoln County Archaeological Initiative. With his colleagues at Far Western, he applies this research to efficiently evaluate archaeological resources and better understand landforms where buried archaeological sites might be preserved and—all with the goal of navigating the project planning and implementation process. Craig is also an avid photographer, musician, and trail runner. Old River Bed Delta Geomorphology and Chronology. In Paleoarchaic Occupation of the Old River Bed Delta, edited by David B. Madsen, Dave N. Schmitt, and David Page, pp. 30-60. University of Utah Anthropological Papers No. 128. University of Utah Press, Salt Lake City. Tufa Village (Nevada): Placing the Fort Sage Drift Fence in a Larger Archaeological Context. Anthropological Papers of the American Museum of National History, No. 102. New York City, New York. Points on a Continuum: Three Sites in a Middle Archaic Settlement System in the Western Great Basin. In Archaeology in the Great Basin and the Southwest: Papers in Honor of Don D Fowler, edited by Nancy J. Parezo and Joel C. Janetski, pp. 85-97. University of Utah Press, Salt Lake City.